Attend a Hands Across the Sand Event to Help us Move Beyond Oil on June 25th. Last year, people across the globe joined together at over 900 events in 39 countries to call for an end to offshore drilling in the wake of the BP oil disaster. Will you help us make this year's event even bigger? Sign up to attend a Hands Across the Sand event on Saturday, June 25th. 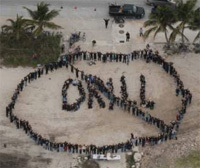 What: Join tens of thousands of citizens as we draw human lines in the sand against the threat dirty fuels and offshore oil drilling pose to our families and our planet. When: June 25th at noon for 15 minutes. Where: Your favorite beach, lake shore or riverfront. The timing of this year's event couldn't be more critical. As gas prices go up through the summer, the pressure to expand drilling mounts. Drilling off our coasts is not only dangerous, but it will have no impact on the price of gas. But there is an alternative. It's time to invest in clean, renewable alternatives, cleaner cars, and transportation options that will end our addiction to oil once and for all. Help us move beyond oil. Sign up for Hands Across the Sand on June 25th. P.S. Help us spread the word by forwarding this message to your friends and family. You can learn more about Hands Across the Sand here. If you do not wish to receive future emails like this, click here to be removed from this type of email contact. No to offshore drilling -- Yes to clean energy!